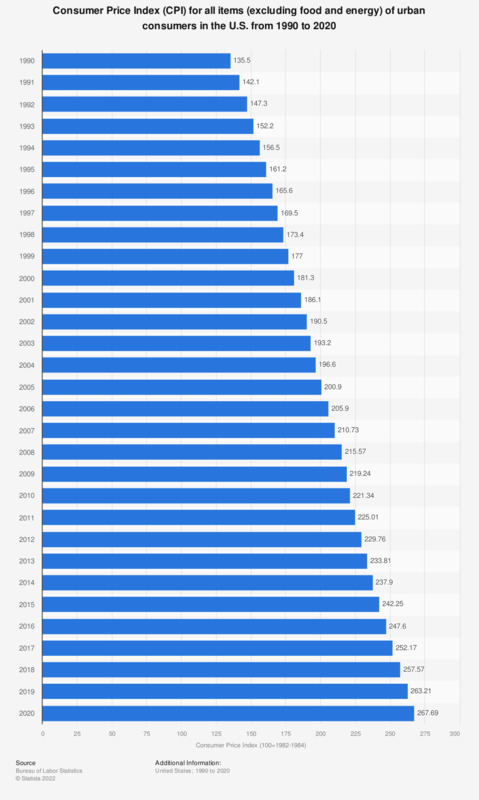 This statistic shows the Consumer Price Index for all items, excluding food and energy, for urban consumers in the United States of America from 1990 to 2018. This selection, also called Core CPI excludes goods with high price volatility, like food and energy, which are non-systemic. In 2018, the CPI stood at 257.57. The annual inflation rate in the U.S. since 1990 can be accessed here. The data represents U.S. city averages. The base period was 1982-84=100. A consumer price index (CPI) measures changes in the price level of consumer goods and services purchased by households. The CPI is defined by the United States Bureau of Labor Statistics as "a measure of the average change over time in the prices paid by urban consumers for a market basket of consumer goods and services."